Click on any part to learn more and view an image of the associated piece. This diagram is from the Smithsonian, but it links to better pictures (including from the Smithsonian). At least nine stone slabs were once part of an elaborate stone couch (shichuang), a rare type of burial furniture used for the repose of the deceased. Couches made for nobles in northern China in the fifth to seventh century are commonly decorated with scenes inspired by the teachings of Confucius (551–479 BCE) or with protective spirits guiding the dead to the afterlife. This base, however, is carved with an unusual combination of Buddhist and secular themes. Double lotus petals—a Buddhist emblem of purity—form a continuous band across the top, while pearl roundels with musicians and dancers dressed in non-Chinese costumes (with boots, tight pants, and belted jackets) appear above figures of Buddhist deities and religious guardians. Charles Lang Freer, the founder of the Freer Gallery of Art, acquired three slabs from a Chinese art dealer in 1915. Five additional parts are now dispersed in other museum collections; one element is still missing. 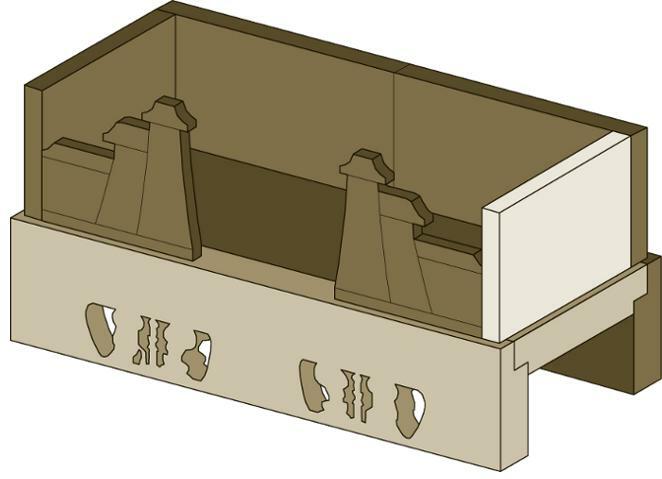 Short tangs projecting from the upper slabs align with these pieces to form the bed. Like the base, the upper pieces feature lively scenes of Sogdian life in China. This combination underscores how the Sogdians traveled far from their ancestral home in Central Asia and freely borrowed from the diverse religions and cultures they encountered. Right Frontal of a funerary couch, China, Henan province, probably Ce xian; Northern Qi dynasty 550-577. Museum of East Asian Art Cologne; Bc 11 12. Left Frontal of a funerary couch, China, Henan province, probably Ce xian; Northern Qi dynasty 550-577. Museum of East Asian Art Cologne; Bc 11 12. End View of frontal of a funerary couch, China, Henan province, probably Ce xian; Northern Qi dynasty 550-577. Museum of East Asian Art Cologne; Bc 11 12. The left lateral stretcher from the base of a funerary couch with Sogdian musicians and a dancer. Freer Gallery of Art F1915.336.